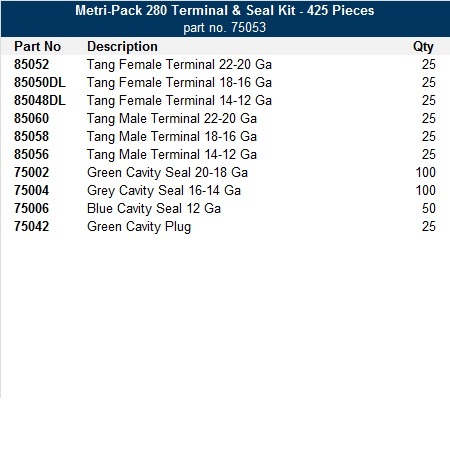 The Metri-Pack 280 terminals and seals kit provides an assortment of the popular Metri-Pack 280 male and female terminals, seals and cavity plugs. This small Metri-Pack 280 kit provides all essential inventory to repair or replace your current Metri-Pack 280 connector assemblies. This kit features the standard terminals that have a metal lock tang that sticks out of the bottom of the terminal. When inserted the lock tang slides/springs over the plastic locking ramp inside the connector then drops down behind the ramp to lock the terminal into the connector body and prevent pullout. 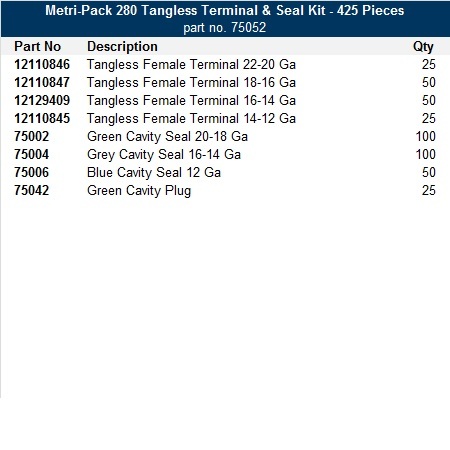 The Metri-Pack 280 "Tangless" terminals and seals kit provides all essential Metri-Pack 280 Tangless female terminals, seals and cavity plugs to complete your sealed fuse panel projects. Tangless terminals do not have the normal tang that the standard Metri-Pack 280 connectors require. Instead, the terminal box is designed with a plastic flexible ramp which is depressed by the terminal during insertion. When the flex lock reaches the notch on the terminal it snaps up into the notch and prevents pullout.